1. 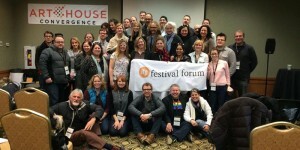 In the coming months, our organization will make the transition to an independent and vocal organization with a new name: we will soon become the Film Festival Alliance. As a community, we will benefit from strength in numbers as we advocate for best practices and symbiotic relationships with filmmakers and distributors. 2. What’s more, membership in the Film Festival Alliance just got a bit sweeter: entertainment legal eagles Michael Donaldson and Corey Field have offered their services as a first line of defense, should any of our member organizations face an unforeseen legal hurdle. This is huge. During our time together, our panels—including a legal clinic from Donaldson and Field—covered the gamut, from rush lines to hospitality to Oscars to board management and beyond. Our roundtable discussions were especially fruitful this year, centering on topics such as social media, sponsorship, ticketing, tech, the (dreaded) program guide, and making the most of a small budget. All of these conversations will continue throughout the year; we’re just getting started. In the weeks to come, we will compile the learnings from our various sessions, sharing the wealth with those who weren’t able to attend and serving as a concrete refresher (and to-do list) for the rest of us. Please stay tuned, and keep in touch on Facebook and Twitter, in addition to the comments selection below. We’ve got a lot of work to do, and it’s easier to do it together. Happy New Year!